FRESNO — An Asian American Democrat is seeking to unseat one of President Trump’s staunchest defenders in Congress next Tuesday. The 22nd Congressional District is centered in the San Joaquin Valley, in Fresno and Tulare counties. It includes most of eastern Fresno and all of Clovis, Tulare and Vista. Since 2003, it has been represented by Republican Devin Nunes, who chairs the House Permanent Select Committee on Intelligence and was a member of Trump’s transition team. Nunes has been criticized by Democrats and some Republicans for hastily ending his committee’s investigation into Russian interference in the 2016 presidential election and concluding that there had been no collusion between the Trump campaign and the Russians. He also attacked the FBI and independent counsel Robert Mueller, alleging that they are abusing their powers in an attempt to hurt Trump. Nunes’ challenger is Andrew Janz, a deputy district attorney in Fresno County who has prosecuted a number of high-profile cases against gang members, career criminals, and alleged murderers. He has risen quickly through the ranks of the District Attorney’s office and his most recent assignment was to the Violent Crimes Unit. Janz’s late father was from Canada and his mother is from Thailand. His father was a Peace Corps volunteer in Southeast Asia in the late 1970s and early 1980s. While he was growing up in Visalia, his father worked in local food processing plants and his mother worked in a local hospital. Janz became a public servant because of his father’s influence. Janz graduated from Redwood High School in 2002 and has spent most of his life in the 22nd District. He earned a bachelor’s degree in economics and a master’s degree in public administration at CSU Stanislaus, where he was a student leader focused on reducing the cost of higher education, expanding recreational programs, and promoting alcohol safety and education. He also helped coordinate a statewide voter registration campaign with the California State Student Association. After graduation, Janz attended Southwestern Law School in Los Angeles where he earned his law degree. While there, he was selected to be a member of the Law Review and elected by his peers to be president of the Student Bar Association. After law school, he clerked for District Court Judge Carolyn Ellsworth in Las Vegas. Ultimately, he wanted to go back home to the Valley and serve his community as a local prosecutor. A member of the Downtown Fresno Rotary Club and the Fresno County Prosecutor’s Association, Janz is a first-time candidate for public office. He describes himself as a concerned taxpayer who’s tired of seeing his region left behind by corrupt politicians on both sides of the aisle. His wife Heather runs her own practice and is president of the Central Valley Chapter of the California Association of Marriage and Family Therapists. They have two dogs named Robin and Rachel. Nunes’ controversial handling of the Russia probe has attracted national attention to the race. Janz has raised $8.3 million to Nunes’ $11.8 million. The Fresno Bee, which until now has supported Nunes, endorsed Janz in an Oct. 6 editorial that read, in part: “The Bee’s Editorial Board had not arrived at a recommendation pending interviews with the candidates to size them up. The Bee sent two invitations to Nunes to attend such a meeting; not once did he reply. Janz, by contrast, made time to sit down and discuss the issues. For that reason — and more — he has earned the recommendation. “Janz, 34, is a moderate Democrat who is campaigning without party support in his first election. The Democratic National Committee has not seen his candidacy as a winner, given the 9-percentage-point advantage Nunes has in voter registration over Janz. The newspaper cited Janz’s moderate positions on immigration and gun control as well as his desire to have someone other than Nancy Pelosi as the House Democratic leader. “As a prosecutor, Janz knows first-hand the impacts of crime on victims. That is also why he has a willingness to help the little guy,” the editorial continued. “For example, Janz wants every American to have access to quality health care. How to make that happen? Janz is open to all ideas, especially town-hall meetings in the district to hear what his constituents think. One thing he says is non-negotiable: Pre-existing conditions must be covered. Nunes has denounced The Bee as “fake news” and accused it of working with “radical left-wing groups” to publish negative stories about him. 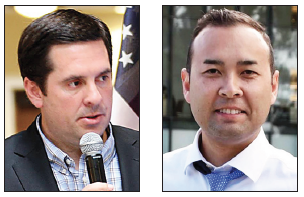 Nunes also accused Janz of campaigning during work hours, prompting Fresno County District Attorney Lisa Smittcamp to publicly deny the allegations. Nunes should be expelled from Congress as well as all Senators and House members who violate their oath of office.